This article is about the type of Italian leader. For the meme, see Doge (meme). For other uses, see Doge (disambiguation). A doge (/ˈdoʊdʒ/; Italian: [ˈdɔːdʒe]; plural dogi or doges) was an elected lord and chief of state in many of the Italian city-states during the medieval and renaissance periods. Such states are referred to as "crowned republics". The word is from the Venetian dialect, reaching English via French. Doge, along with the related English word duke and the Italian duce, descends from the Latin dux, meaning "leader", especially in a military context. The wife of a doge is styled a dogaressa and the office of the doge is termed dogeship. The title of doge was used for the elected chief of state in a number of Italian "crowned republics". The two best known such republics were Venice (where in Venetian he was called doxe [ˈdɔze]) and Genoa (where he was called a dûxe [ˈdyːʒe]) which rivalled each other, and the other regional great powers, by building their historical city-states into maritime, commercial, and territorial mini-empires. Other Italian republics to have doges were Amalfi and the small town of Senarica. In several writings of Theodor Herzl, founder of Zionism, he proposed that the future Jewish State take the title of "Doge" for its head of state – but this was not taken up by the actual state of Israel. After 1172 the election of the Venetian doge was entrusted to a committee of forty, who were chosen by four men selected from the Great Council of Venice, which was itself nominated annually by twelve persons. After a deadlocked tie at the election of 1229, the number of electors was increased from forty to forty-one. New regulations for the elections of the doge introduced in 1268 remained in force until the end of the republic in 1797. Their object was to minimize as far as possible the influence of individual great families, and this was effected by a complex elective machinery. Thirty members of the Great Council, chosen by lot, were reduced by lot to nine; the nine chose forty and the forty were reduced by lot to twelve, who chose twenty-five. The twenty-five were reduced by lot to nine and the nine elected forty-five. Then the forty-five were once more reduced by lot to eleven, and the eleven finally chose the forty-one who actually elected the doge. None could be elected but by at least twenty-five votes out of forty-one, nine votes out of eleven or twelve, or seven votes out of nine electors. Initially the doge of Genoa was elected without restriction and by popular suffrage. 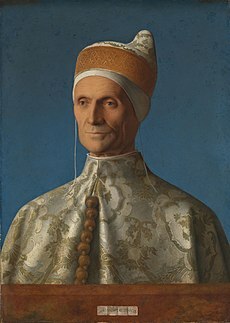 Following reforms in 1528, plebeians were declared ineligible, and the appointment of the doge was entrusted to the members of the great council, the Gran Consiglio. In Venice, doges normally ruled for life, although a few were forcibly removed from office. While doges had great temporal power at first, after 1268, the doge was constantly under strict surveillance: he had to wait for other officials to be present before opening dispatches from foreign powers; he was not allowed to possess any property in a foreign land. After a doge's death, a commission of inquisitori passed judgment upon his acts, and his estate was liable to be fined for any discovered malfeasance. The official income of the doge was never large, and from early times holders of the office remained engaged in trading ventures. Originally, Genoese doges held office for life in the so-called "perpetual dogeship"; but after the reform effected by Andrea Doria in 1528 the term of his office was reduced to two years. The ruling caste of Genoa tied them to executive committees, kept them on a small budget, and kept them apart from the communal revenues held at the Casa di San Giorgio. ^ Schaus, Margaret, ed. (2006). Women and Gender in Medieval Europe: An Encyclopedia. Oxford: Taylor & Francis. p. 217. ISBN 9780415969444. ^ "Doge (dəʊdʒ)". Collins English Dictionary. Retrieved 18 August 2014. ^ Cavalli, Giovanni Giacomo (1630). La Cetra Genovese. Genoa: Giuseppe Bottari. p. 130. ^ Guida Italia: Abruzzo Molise (4th ed.). Milan: Touring Club Italiano. 1979 . ISBN 9788836500178. ^ Friedman, Saul S. (2006). A History of the Middle East. North Carolina: MacFarland & Co, Inc. p. 220. ISBN 0786423560. ^ a b Miranda Mowbray; Dieter Gollmann. "Electing the Doge of Venice: Analysis of a 13th Century Protocol". Retrieved July 12, 2007. ^ a b Kleinhenz, Christopher, ed. (2004). Medieval Italy: An Encyclopedia. 1. London: Routledge. pp. 635–36. ISBN 9781135948801.